Istanbul is an ancient and beautiful city with a long history at the centre of major empires including the Roman, Byzantine, Latin and Ottoman. It is a city inundated with rich culture and history. In 2010 it was named a European Capital of Culture, which helped make it the world’s tenth most popular tourist destination. Home to over 11 million people, it is also one of the most populated cities in the world. But this thriving and seemingly indestructible metropolis sits on a loaded spring: The North Anatolian Fault. The most active and earthquake prone fault system in Turkey, and the source of the 1999 magnitude 7.4 earthquake that killed nearly 18,00 people in the city of Izmit. 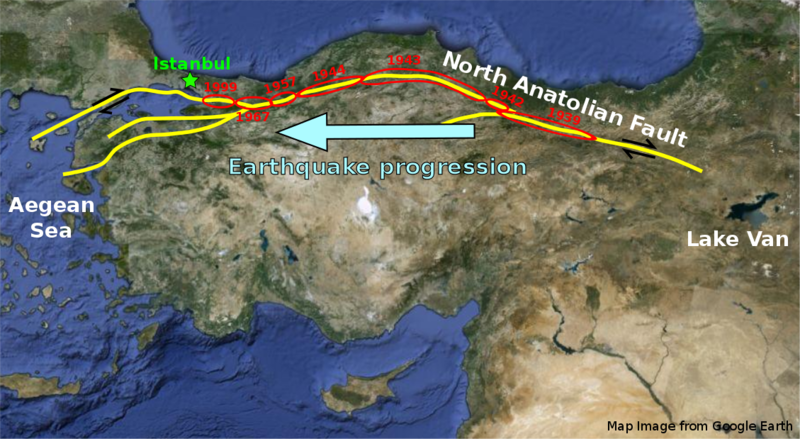 The North Anatolian Fault is about 1300km long running along the entire length of northern Turkey, from the Aegean Sea in the west to Lake Van in eastern Turkey. Curiously, large earthquakes on the fault have tended to follow a successive sequence, i.e. an earthquake will often occur on the section of the fault adjacent to the last rupture. The current sequence started in 1939 with the magnitude 7.9 Erzincan earthquake, which killed over 30,000 people, and has been progressing to the west in a series of 8 large events. Researchers in 1997 used this observation to successfully predict the location of the 1999 Izmit earthquake (if not the exact time). Worryingly the Izmit earthquake ruptured less than 100km to the east of Istanbul. Further work has led other researchers to predict a major earthquake, possibly another large magnitude 7.4, in the Istanbul region within the next 20 years! So what can we do? Firstly, we need to better understand the science behind the cause of earthquakes in this region. The FaultLab project based at the University of Leeds involves research on the the ground movements around the North Anatolian Fault during various stages of the earthquake cycle. A greater understanding of the fault system can be used in forecasting models to give a better idea of the seismic risk. Secondly, more engineering work needs to be done to reinforce vulnerable buildings that would collapse in the event of ground shaking. In May 2012 the Turkish government passed a new Urban Transformation Law requiring all buildings that do not conform to current earthquake hazard and risk criteria to be demolished. This effectively means nearly 6 million buildings throughout Turkey will be demolished over the next two decades! This massive project is expected to generate over USD 500 billion worth of construction industry over the next decade. A new rail line that runs beneath the Bosphorus Straits and links the east and western parts of the city will be able to withstand shaking from a magnitude 9 earthquake. The new airport terminal for the Sabiha Gokcen international airport that serves the city of Istanbul has also been built to withstand shaking from a magnitude 8 earthquake and importantly, remain operational afterwards. This is critical, as when a disaster does strike the airport will be one of the main entry points for international relief and aid. But the key question is: will Turkey and Istanbul in particular be able to finish all its ambitious redevelopment plans before the next major earthquake? How does a seismic hazard turn into a seismic disaster? Professor Iain Stewart explains in the ‘Anatomy of an Earthquake’.